And the finished product is the cutest door prize ever! When our wines arrive each month from Direct Cellars, I am doing monthly wine tastings when each shipment of new wines arrives. What I like best about doing this is that it’s a perfect excuse to get together with people after regular work hours – and not too late to get home early or have dinner out somewhere. 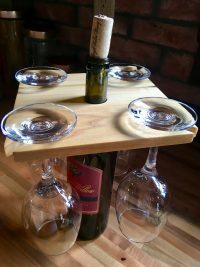 Afternoon wine tastings on Wednesdays… the perfect help over the hump day… and I’m having so much fun planning the latest tasting, I went a little overboard and made some door prizes and party favors before I even figured out the food! Luckily, my husband, Bobby, can make literally anything I find on Pinterest. We spent a weekend working on these wine caddies, perfect for take-a-long wine at a picnic. Could be just the right gift for your hostess. Or, it could be a very thoughtful closing gift at a sale, for my fellow real estate agents. You can see how they turned out. I’m super happy that four people at the tasting will win these as door prizes, and now I’m obsessed with using different woods. 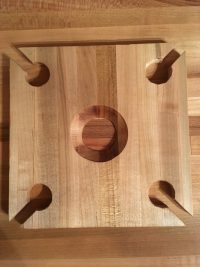 These were made from some of the butcher block and birch we had leftover from our kitchen renovation… now I’m checking with lumber yards for other ideas, and the Green Project, of course, for some Katrina scraps. That’s always a hit with out-of-towners. 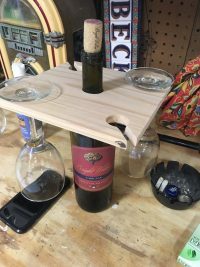 So… what started as a side business to complement my real estate sales has now given me a creative outlet for new DIY projects, and yet another excuse to hang out in the “man’s world” of Bobby’s workshop with him. 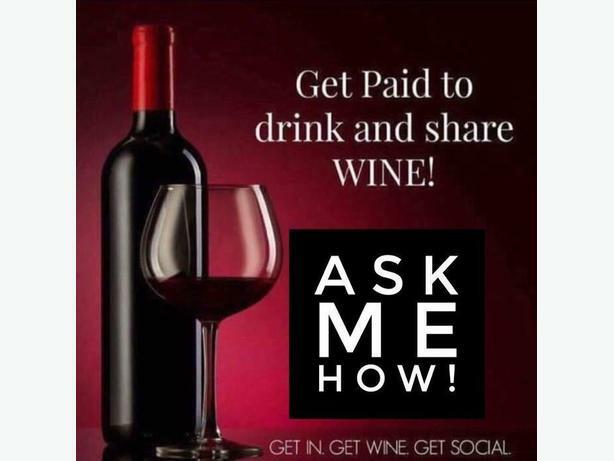 Start your own shipment of wines from around the world, with me as your referring member. Just click here. Clicking doesn’t sign you up for anything, but you can learn all about it, sign up if the spirit moves you, and there’s no obligation to keep getting your shipments – but they guarantee satisfaction. Join our NOLA Wine Tasting Group on Facebook, where we post events, chat about wine and share articles that help us learn more about each month’s selections. Thanks for enjoying a little fun on the side with me!